High quality digital imaging equipment is an essential and integral component for diagnosis and treatment of our patients. CVRC has invested in comprehensive, complementary, and high quality imaging modalities to support our clinicians’ ability to visualize the internal body structures of our patients. Diagnostic imaging often requires the use of several of these different technologies to obtain the information needed to diagnose and treat our patients. These imaging modalities include digital radiography, ultrasound, echocardiography, CT Scan, C-arm (fluoroscopy), MRI, arthroscopy, laparoscopy, thoracoscopy, and flexible and rigid endoscopy. 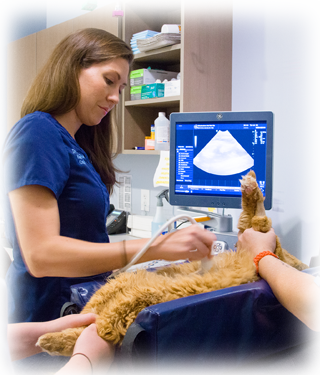 We can easily share patient’s images with our staff clinicians, the primary veterinarian, and other specialists across the country (through telemedicine) for prompt review, interpretation, and collaboration, ensuring the highest level of care for our pet patients. X-ray imaging is used to visualize internal structures of patients, and is used for a wide range of applications including imaging of the thorax, abdomen, skeletal structures, limbs and a variety of special imaging procedures. DR images are available within seconds to be viewed on a high-resolution monitor with no need for film developing. Examination rooms are equipped with flat screen LCD viewing stations for reviewing the images with pet owners. All radiographic studies are interpreted by board certified specialists. These images are easily constructed in axial, dorsal, sagittal and oblique planes for review by the clinician or radiologist. As in CT, MRI is often performed using an intravenous contrast agent that enables us to better visualize certain structures and abnormalities. MRI yields the highest level of soft tissue detail compared to other imaging modalities (CT, digital X-ray). This sensitivity allows for highlighting desired structures or tissues by adjusting settings on the MRI machine. Ultrasound is used as a diagnostic tool to obtain more detailed information about internal body structures. Ultrasound machines use sound waves administered by a small handheld device called a probe, waves are reflected back to the probe, and a computer formats these into visual pictures on a monitor for the clinician to review. Ultrasound is painless and noninvasive. Arthroscopy involves the passage of a rigid scope into a joint, connected to a camera and monitor, to visualize the inside of a joint and certain procedures can be performed to help diagnose and treat various conditions, as well as obtain diagnostic samples for laboratory analysis. Laparoscopy involves the passage of a rigid scope into the abdominal cavity, connected to a camera and monitor, to visualize abdominal organs, and certain procedures can be performed to help diagnose and treat various conditions, as well as obtain diagnostic samples for laboratory analysis. Thoracoscopy involves the passage of a rigid scope into the thoracic cavity, connected to a camera and monitor, to visualize thoracic organs, and certain procedures can be performed to help diagnose and treat various conditions, as well as obtain diagnostic samples for laboratory analysis. All three of these procedures require anesthesia and are performed in a sterile operating room suite by one of our board certified specialists. Additional information on these procedures is available on our surgical services page. Fluoroscopy is an imaging technique that uses X-rays to obtain real-time moving images of the internal structures of a patient. Fluoroscopy is used for dynamic studies to look for functional abnormalities in various body systems. Additionally, fluoroscopy is used to guide implant placement or to help obtain tissue samples. Depending on the type of study, sedation or anesthesia may be necessary.